Marina Textil, manufacturer specializing in technical fabrics, has launched some informative ebooks on the fabrics with which the garments of the employees of different professional sectors are made. The answers to all your questions will be found in our ebooks, in addition to other data related to safety and protection, the regulations that the fabric must meet and the comfort and durability of garments made with these fabrics. Do you know the ISO EN 61482-1-2/ASTM F1959 Standards? What do we mean when we speak of electric arc flash? 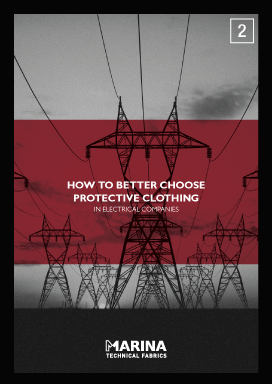 How to recognize if a fabric is under the risk of the electric arc flash? Do you know the ISO9185 Standard? What do we mean when we talk about large splashes of molten metal? 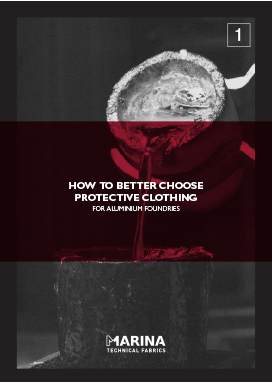 How to recognize if a fabric is under the risk of splashing molten aluminum?